Technorati CEO Richard Jalichandra, fresh off a new funding and site relaunch, is showing some of the highlights from their annual State of the Blogosphere report today at BlogWorld in Las Vegas. We’ll have a video of his full video presentation shortly. In the meantime, we’re embedding the power point presentation below. Key points Jalichandra brought up – What’s the no. 1 success metric for a professional blogger? What do successful bloggers have in common? The data was taken from a survey of 2,900 bloggers, conducted by Penn, Schoen & Berland. 72% of bloggers are hobbyists, says Jalichandra, and blog for fun. They don’t make any income from blogging, and only half hope to someday. They blog simply to express themselves. 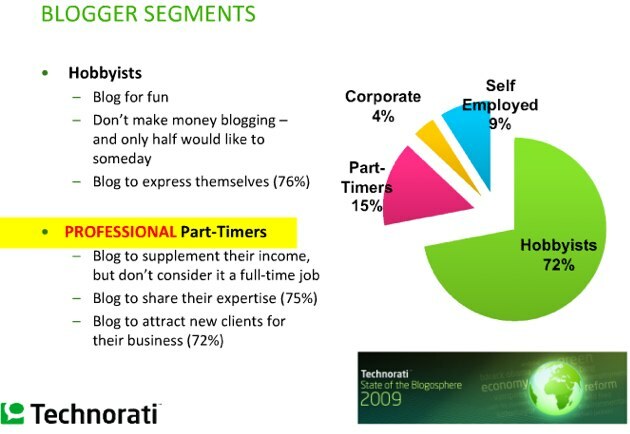 Of professional bloggers, only 10% blog 40 or more hours per week. 2/3 of professional bloggers are male, and 60% are between 18 – 44 years old. 75% have college degrees, and 40% have graduate degrees. Half have household incomes of $75,000 or more. 17% of them say blogging is their primary source of income. A whopping 74% of bloggers use Twitter, v. 14% of the general population. Their no. 1 use of Twitter is to promote their blogs. Lots more detail in the full presentation, below. You can see the audience reaction on Twitter here.